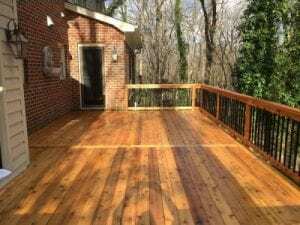 Update for 2019 on What is the Best Deck Stain: This is the updated version of our most popular article on DeckStainHelp.com. We help by guiding consumers in finding a high quality and low maintenance deck stain based on a series of questions. This article alone has had over 17,000 Q&A questions and over 500 Star Rating/Reviews to date. Please also visit our updated article here: The Best Deck Stains? This is the most popular question that deck owners have. Unfortunately, there is not a “best” deck stain out there. There are products that are better than others, but there is not one that will outperform every other stain. A better way to approach this common question is to ask, “what is the best stain for my deck and it’s environment”? Just because a deck stain performs well in the Northeast part of the country does not mean it will perform well in the high altitudes of Arizona. There are also VOC (Volatile Organic Compounds) Laws the come into effect for different parts of the country. This may limit what is available in your state. For example, TWP 100 Series cannot be used in 17 states that have a low VOC content of 250. UV rays from the sun will damage the wood resulting in degradation of the wood cell structure. This will break down the stain while causing the wood to oxidize (turn gray). Water, snow, and ice will cause damage to the wood by breaking down the exposed cellular structure. Freeze/thaw will expand and contract the wood resulting in the stain “bond” with the wood cells to fail. Mold, mildew, and algae will leave the wood unsightly/dirty and can result in rotting. High traffic areas will leave “wearing” patterns. The previous stain used was of low quality or applied poorly. The Stain was not applied properly or the wood was not prepped properly prior to application. Bad prep is the number one reason stains prematurely fail! Update on Deck Stain for 2019 Please read this article and post any questions you have in the comment are below. Our newly enhanced website now offers the ability to upload and post pictures of your exterior wood or deck. Deck stains have not changed much in the past few years. Many brands have gone away from oil-based stains to water based, but you are still able to use oil-based stains in all US States and Canada. We currently restore about 300-400 decks annually, and our favorites are the penetrating semi-transparent and semi-solids. We have been getting great feedback here at www.deckstainhelp.com from all of the consumers who have been looking for better stain alternatives for their deck restoration. Our most popular article, “What is the Best Deck Stain” has quickly become the number one article on the web for asking questions and getting answers on restoring your exterior wood and deck. In this article, we are going to cover what actually is a “Deck Stain”. We will compare the many different types of decking stain options available and what are the positives and negatives of each. Deck stains are used to protect and preserve your exterior wood. They offer UV protection, water repellency, mold and mildew resistance, etc. Deck coatings come in many different types of opacity and bases. Many deck stain brands can be restricted in certain states, cities, and counties based on their VOC laws. Deck staining can be a “chore” for residential homeowners and unfortunately walking into your local store may produce some of the worst options available. Not all deck stains are created equal and there is not a perfect stain type or brand that will outperform all the others. Water based deck stains have come on rapidly in the last 4 years. The main reason for the vast amount of water-based stains on the market today is related to changes in VOC laws across the country. Many states have adopted or soon will adopt lower VOC (Volatile Organic Compounds) regulations. This has prompted stain manufacturers to increase production of water-soluble decking stains. In our opinion, water-based deck stains are “thin” paints with varying amount of acrylic and pigment. Pros: Water cleanup, less chance of mold or mildew growth. Environmentally friendly. Cons: Do not penetrate as an oil-base can. Slightly harder to apply as they dry quicker. Can be prone to peeling and wearing. *Restore-A-Deck Wood Stains and Defy Wood Stains are the only exceptions that we have tested. They penetrate the best of all water-based stains, nearly as well as an oil. Oil-based decking stains have been around for 20-30 years and have been traditionally what all stain manufacturers produce. Oil-based stains are typically made up of natural and synthetic oils. Many contain oils: Linseed Oil, Paraffin Oil, Tung Oil, Rosewood Oil, Etc. Pros: Excellent penetration into wood. The better a deck stain can penetrate, the better the performance. Easier to apply. More natural looking. We appreciate your input here at Deckstainhelp.com as we continue to be your go-to source for the latest in deck restoration news and trending topics through 2019. See below for an article about How to Apply Deck Stain. How to Apply most Deck Stains and Sealers. These tips are for Transparent, Semi-Transparent, and Semi-Solid deck coatings. If you have a wood deck, at some point, you will have to stain and seal it. Staining your deck allows it to withstand the elements such as severe weather, foot traffic, and scuffing from heavy furniture. Before you begin, make sure you plan ahead. Ensure there’s no rain in the forecast or excessive pollen levels that create an ideal environment for mold to grow. Please note that instructions for staining and sealing a deck will vary from product to product, so read the instructions for best results. These are some basic tips that will aid in deck staining and sealing. First, clean off the wood deck thoroughly if the wood is gray or if repeating the use of the same brand previously. If there is any existing deck stain or sealer, that must be removed by stripping and or sanding the wood prior to applying a new coat. How to remove the old coating will vary based on the brand type of stain that was previously. We have numerous articles on our website and sanding or striping deck stains. Welcome to Deckstainhelp.com, your source for the latest in deck stain developments, industry insights, and tips. See below “wet on wet” application directions to be used when you are applying a deck stain in 2019. We want to hear from you. Leave us a comment below about your projects that involve “wet on wet” application. Deck Stain Application Instructions for 2 coats “Wet on Wet”. The term “wet on wet” refers to a two-coat application process specific to semi-transparent penetrating stains. In the wet on wet method, the first application of stain is applied to an area. Then before the first coat dries or cures, a second coat is applied over the top. This method ensures that the first coat, being still wet, has not sealed the boards from accepting more stain. Here at DeckStainHelp.com, we are proud of the fact that we are the Internet’s number one reference for your deck stain opinions and reviews. We thank you for your continued support. Clear deck sealers continue to be a great option for protecting your wood deck from water damage, but unfortunately, do not provide any protection against UV rays and graying/wood darkening. If you have used clear deck sealers, we would like to hear what you think, so feel free to leave a comment below and pictures of your completed projects if you have them. It is no secret that protecting a wood deck with a water repellent sealer is vital to its integrity and lifespan. Clear deck sealers leave the wood looking natural which may appeal to the deck owner. Without a doubt, a natural looking wood deck is a thing of beauty. Deck sealers do give adequate water protection by locking out moisture. This is important to the wood’s lifespan. When water is absorbed into the wood it swells and when it dries up it shrinks. This continuous swelling and shrinking eventually begins to crack, split, and warp the wood. A clear wood sealer will stop this water damage from happening. Here at DeckStainHelp.com, we are proud of the fact that we are the Internet’s number one reference for your deck stain questions, opinions, and reviews. In this updated article for 2019, we outline the differences between deck stains and clear deck sealers. Clear deck sealers continue to be an option for protecting your wood deck from water damage, but unfortunately, do not provide any protection against UV rays and graying/wood darkening. We would like to hear what you think, so feel free to leave a comment below with pictures of your projects if you have them. Should you use a Deck Stain or Clear Deck Sealer? To enhance the appearance of a wood deck and protect it from the elements the wood need to be treated with a deck stain or sealer. Both deck stains and deck sealers protect against moisture and water damage but there are some differences between the two. We appreciate your input here at Deckstainhelp.com as we continue to expand our content and serve as your go-to source for the latest in deck restoration news and trending topics through 2019. In this updated article, we provide some tips for the best way to stain and seal your wood deck. As always, make sure you read the directions, as they vary from brand to brand. Feel free to leave a comment below. The instructions for staining and sealing a deck will vary from product to product. It’s always best to follow the manufacturers suggested application instructions for the best results. There are however some basic tips and techniques that will aid in staining and sealing with any deck protection product. We appreciate you visiting Deckstainhelp.com as we continue to be your go-to source for the latest in deck restoration news and trending topics through 2019. Below, we talk about Why Penetrating Deck Stains are Best. Feel free to leave a comment below with any pictures you may have. Finding the right stain for your wooden deck is the key to getting lasting results. But with so many deck stain choices it can be a daunting task, to say the least. To narrow down the search for the best deck stain you first need to understand what the different types of protection are. Without getting into oil vs. water based debate or colors, tones, and opacity levels there are basically two different types or characteristics of a deck stain – film forming and penetrating. Both of these deck stain characteristics will provide adequate protection from the sun and lock out unwanted moisture. They both can also enhance the beauty of the wood and provide general overall protection from mold and mildew, freeze/thaw damage, and heavy foot traffic. Two-toned decks are popular among many deck owners for 2019 for multiple reasons. A two-toned deck normally has paint or solid deck stain on the railings and spindles and the deck floor is stained with a transparent or semi-transparent deck stain. There are several advantages to having a two-toned deck. Being able to match or blend the deck in better with the house without having to give up the natural wood look is one benefit. Most houses have 2-3 different colors including the siding, trim, shutters, gutters, fascia, etc. When a wood deck is all natural with a translucent stain it sticks out more from the house. Some deck owners like the deck to blend with the house a little better so they coat the railings and supports with a solid deck stain color to match. The deck floor can then be stained with a semi-transparent stain so it still has that natural wood appearance. 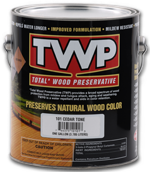 TWP 100 Series Wood and Deck Preservative has been manufactured for over 25 years while proving to be one of the best products on the market. TWP Stains are registered as wood preservatives by the Environmental Protection Agency, the only stain to achieve this distinction. TWP 100 Series is a 550 VOC compliant wood stain that is available currently in 36 states. Composed of natural and synthetic oils, TWP 100 Series will provide ample protection from snow, rain, and UV radiation. TWP 100 Series has been rated #1 by Consumer magazine. – We tested the 101 Cedartone color for the pool deck. The semi-transparent color was a traditional cedar color, slightly orange/yellow. The stain had no issues penetrating into the wood completely and did not mask the wood grain. – The TWP 100 Stain retained 80% of the original color after 2 years of weathering. – TWP 100 exhibited zero peeling of the stain after 2 years. Slight wearing around the stairs where the wood butted up to the pool. This area was slightly more faded as well. Possibly from the chlorine in the pool. If you have used the Flood CWF, please post a review in our Star Ratings and or comment area. Our comment system does allow the ability to post pictures of your deck or exterior wood. 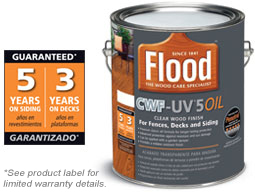 Flood CWF-UV 5 OIL is a high quality translucent, transparent and semi-transparent wood finish for exterior wood. It is a deep penetrating oil that is fortified with Flood’s Penetrol additive for maximum protection. Containing transparent oxides to protect from graying and ultraviolet damage. Note: Flood CWF products have undergone numerous changes in the last 20 years. Flood back in its heyday was at the top of the stain world with their original oil-based formula. This formula is no longer available as the company has gone through numerous changes such as product reformulation (change from oil to water-based), name changes (Supreme Performance), and parent companies. Flood is currently owned by Akzo Nobel. It seems that Flood has gone back to its roots by reviving the CWF formulation that powered this company in the first place. We only hope that the CWF is as good as it used to be in the early 1990’s. – The Flood CWF in the transparent cedar color had a nice golden color with a hint of orange. The cedar deck was highlighted with a rich color but the knots of the wood were very light, almost blond in color. There were a few shiny spots throughout the deck where the stain did not absorb very well. – Flood CWF did okay at the two-year mark where about 70% of the original color remained on the wood. We were pleased but had hoped for better results. – We noticed a small amount of wearing on the stairs after the two years. Most of the deck did not have any issues. We appreciate you visiting Deckstainhelp.com as we continue to be your go-to source for the latest in deck restoration news and trending topics through 2019. Below, we talk about Film Forming vs. Penetrating Deck Stains. Feel free to leave a comment below with any pictures you may have. A wood deck can be subjected to tough weather conditions. Deck floors are subjected to the excessive friction caused by heavy foot traffic. Because the flooring and tops of the handrails are horizontal surfaces, they are more exposed to harmful UV rays and moisture than the vertical surfaces of the deck. This constant moisture followed by drying out, along with fluctuating temperatures causes the wood to expand and contract almost daily. This constant swelling and shrinking can result in cracking, splitting, and splintering. To prevent damage to the wood, it’s necessary to block out the sun’s damaging UV rays and to prevent moisture from penetrating the wood. Applying a quality deck stain to the wood is the best level of protection. Deck stains do require maintenance every couple of years but you’ll get many more years of life out of your deck.